Enjoy all-day unlimited New York's Finest Pizza, #4 Cheese Pizza, and unlimited soda for only P299 when you dine in on July 4, 2017 at all participating Yellow Cab Stores. - Promo duration is on July 4, 2017, 12am-11:59pm (for 24-hour stores), and regular operating hours on July 4, 2017 for other stores. - All transactions beyond 11:59pm shall no longer be allowed to avail the promo. - Customers can stay for maximum of 2 hours upon receipt of payment. - Promo price is P299/head (VAT inclusive). 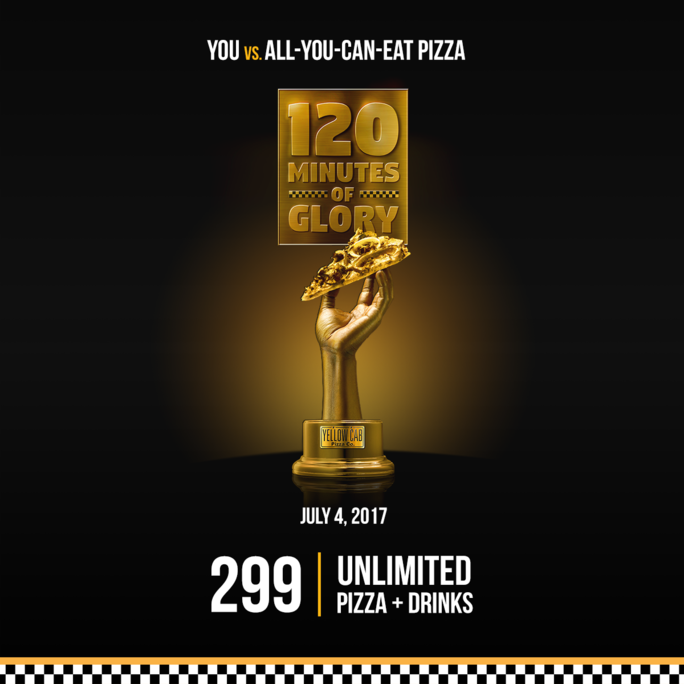 - This promotion is available in all Yellow Cab stores nationwide (except Kidzania, NAIA 3, MOA Arena, Brent, Camaya Coast, and Angeles Pandan). - Available for Dine-in transactions only. - Participating products are Large (14”) New York’s Finest pizza, and Large (14”) #4 Cheese pizza cut into 16 slices. - Strictly no leftovers. Customers will be charged an amount of 1 regular-priced 14” New York’s Finest pizza for wastage of food. - Strictly no sharing of the pizza and soda to other parties who have not purchased the promo. - This offer is not valid in conjunction with any other promotion. - This promotion is not convertible to cash or any other items. - In the purchase of goods and services which are on promotional discount, the senior citizen can avail of the promotional discount or the discount provided under the expanded Senior Citizens Act of 2010, whichever is higher.